1.Workshops on the Study and Documentation of the Indigenous/Traditional Medicinal Knowledge, ethnic medicinal plants and indigenous methods of healing of the ethnic communities during November 2013 to January 2014 at the various locations of the ethnic communities. Workshops were held by IRDIS under the aegis of the National Rural Health Mission, Assam, at the community locations of the five ethnic communities namely the Tiwa, the Amri Karbi, the Tai Phake, the Sinpho and the Nath Jogi of Assam to discuss the importance of the above project and to seek their co-operation in carrying out a Survey related to the documentation of the traditional medicinal plants, methods of healing and indigenous medicinal knowledge of the respective communities. A workshop and interactive session were held on 2nd November 2013 at Jagiroad, Morigaon district which was attended by the Senior members, both men and women of the Tiwa community from different neighboring Tiwa villages. The workshop was to apprise the community members of the importance of documentation of the traditional medicinal plants and traditional medicinal knowledge of the Tiwa community in their community locations. The workshop was addressed by Shri Jursing Bordoloi, a senior member of the Tiwa community, conducted by Dr. Deepa Dutt, Project Director and Executive Director of IRDIS. A workshop and interaction session was held on 8th November 2013 at Lalmati in Kamrup (Metro) district of Assam at the premises of the Amre Karbi Community. The workshop was on the study and documentation of the traditional medicinal knowledge of the Amri Karbi community of Assam. The workshop was addressed and conducted by the Project Director Dr. Deepa Dutt and by Shri Horeshwar Ronghang, President of the Amri Karbi Student’s union . Many senior members and youth of the Amri Karbi Community who came from far off Amri Karbi villages participated in the workshop. 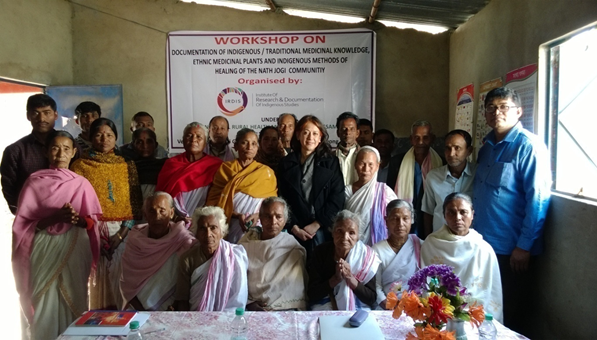 A workshop and interactive session on traditional medicinal knowledge of the Tai Phake community was conducted by IRDIS on the 28th November 2013 at the Ninggham Buddhist Monastery in Ninggham Village at Margherita Subdivision of Tinsukia district. 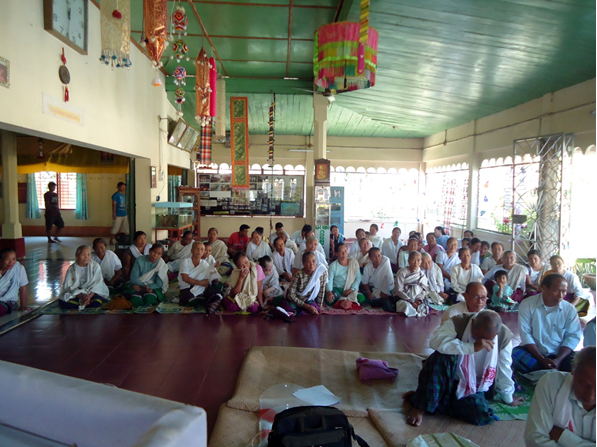 Senior members, both men, and women possessing traditional medicinal knowledge attended the workshop from the Tai Phake villages of Margherita sub-division. Another workshop and interactive session were held on 30th November 2013 at Nam Phake Buddhist Temple, Namphake Village, Nahorkotia, Dibrugarh district, well attended by senior members of the Tai Phake community, the majority being womenfolk, from the villages of Namphake and Tipam. The workshop was addressed by Dr. Deepa Dutt who apprised them of the Project on the Documentation of Traditional medicinal knowledge of the community and sought their active participation. 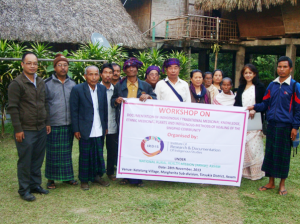 A workshop, discussions and interactive session on the Traditional Medicinal Knowledge of the Singpho community was held on the 28th November 2013 at the Auditorium of the Eco Lodge in Ketetong Village of Margherita Subdivision of Tinsukia district. The workshop was attended by members of the Singpho community belonging to Singpho villages of Tinsukia district. The workshop was conducted by Dr. Deepa Dutt of IRDIS to emphasize the importance of documentation of Indigenous medicinal plants and traditional methods of healing. A workshop and interactive session were carried out by IRDIS on 12th January 2014 at Swargeo Hari Gogoi Prathomik Vidyaloya in Roja Mayong Village at Morigaon district of Assam to emphasize the importance of documentation of the age-old traditional medicinal knowledge of the Nath Jogi community on the traditional methods of healing. The senior members, both men, and womenfolk of the community with indigenous medicinal knowledge attended the workshop and actively participated in the interaction session. 2. 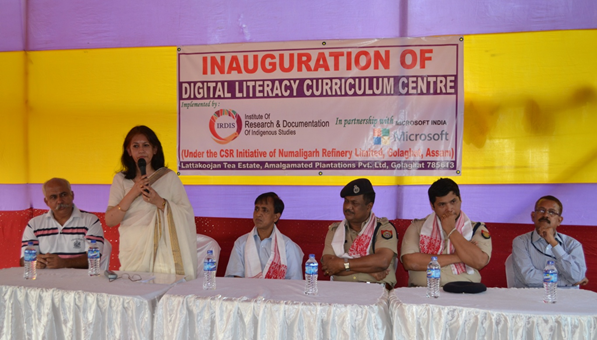 The Inaugural function for the launch of the Digital Literacy Curriculum (DLC) Center within the premises of the Lattakoojan Tea Estate at Letekujan in the district of Golaghat of Assam was held on the 21st May 2014. The Centre at Letekujan is the first DLC Program to be implemented by the Institute of Research & Documentation of Indigenous Studies in partnership with Microsoft India under the Corporate Social Responsibility (CSR) initiative of Numaligarh Refinery Ltd (NRL), Golaghat, Assam. 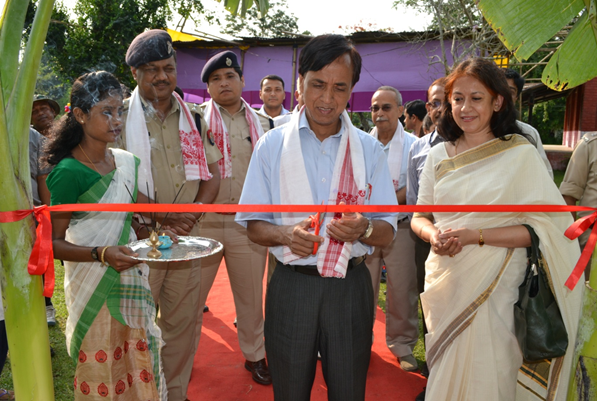 It is through centres of this kind that IRDIS proposes to impart digital literacy and computer skills to the student community in the remote rural and semi-rural regions of Assam .The students can avail of this facility free of cost. The DLC Center was declared open by the Chief Guest, Shri Nur Hussain ACS, Additional Deputy Commisioner (Education) in the presence of an august gathering . The Inaugural function was attended and addressed by Shri Nur Hussain as the Chief Guest, Shri PC Saloi IPS, DIG Central Range, Shri Shiladitya Chetia IPS, SP Golaghat, Dr. Deepa Dutt, Executive Director IRDIS, Shri PK Sharma, Senior Manager (CSR) NRL, Shri Dhiraj Kakati, Advisor APPL Foundation, Shri Arvind Kapoor, Senior Manager Lattakoojan TE. The officers of NRL and the Lattakoojan TE, APPL, management as well as the students and teachers of the locality attended the function.